Dovecotes were a common sight throughout Britain and across mainland Europe between the 16th and 19th centuries, but today few remain and of those that do, many are now in ruins. Dovecotes are specially constructed pigeon houses where pigeons were kept for a variety of purposes, but in the main as a source of food. Other uses for the domesticated pigeon were as quarry for falconry and as a target for shooting matches that were common in the 19th century and in which as many as 120 birds were shot for sport in each match. 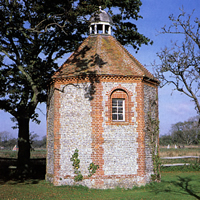 Dovecotes can be constructed of virtually any material (although early dovecotes were constructed exclusively of stone) and can be free-standing structures or provided as part of an existing structure or as a ‘lean-to’ addition. The earliest dovecotes may have been introduced to Britain by the Romans based on the fact that pigeon rearing was common in Italy with dovecotes being provided close to villas and farmsteads for the purpose of food. Over half a century ago C.D. Chalmers suggested that a number of unexplained foundations on Roman sites in Britain were the remains of ancient dovecotes, but his views have never been corroborated. Due to the lack of any firm evidence that dovecotes were introduced into Britain by the Romans it is likely that it was the Normans that first introduced the dovecote and as a result domesticated the rock dove from which the feral pigeon of today is descended. One of the earliest British examples is believed to be a 12th century dovecote that was uncovered during archaeological works in Raunds, Northamptonshire. This early dovecote is circular and commonly known as a ‘rubblestone dovecote’. A number of these early rubblestone dovecotes, dating back to the 12th and 13th centuries, have been uncovered throughout southern England in recent years and with quite a significant geographical spread ranging from Devon in the south-west through to Lincolnshire in the east. These early dovecotes were built mainly to service the culinary needs of monasteries, castles and manors but were the sole preserve of the wealthy and almost certainly beyond the means of the poor. 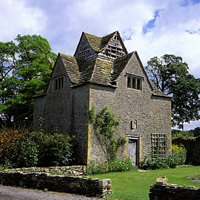 In Medieval and Norman times the building of a dovecote was a feudal right restricted to lords of the manor, abbots and barons with these privileges eventually extending down to the humble parish priest. Today very few of these structures remain intact. 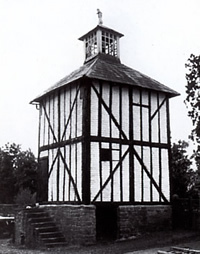 It was in the 16th century that dovecotes became popular in Britain with a huge variety of different designs and types being constructed. Ancient dovecotes are believed to be round in shape but later in the 17th century square, rectangular and octagonal dovecotes were built, some with incredibly intricate designs. 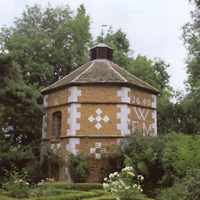 Further designs and types include ‘lectern’ dovecotes, ‘in and out’ dovecotes, ‘polygon’ dovecotes and even caves have been adapted for the keeping of domesticated pigeons. Lectern dovecotes are shaped like a reading desk, hence their common name, and normally consisted of a 4-sided building with a single pitched roof with raised parapet walls on 3 sides. 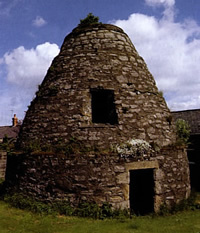 In and out dovecotes, sometimes known as Irish dovecotes, consisted of tiers of breeding cubicles together with perching ledges that were built into the exterior wall of a house or building. Polygon dovecotes (polygon, in this context, meaning a building with more than 5 sides) are more often than not octagonal structures ranging dramatically in size and often housing large numbers of birds. Caves, both coastal and inland, have been used to house domestic pigeons but their use is less common than the conventional dovecote. 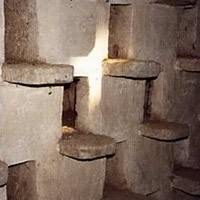 The interior of a dovecote is usually a large open space with the breeding cubicles or ledges being offered in rows around the internal walls. Pigeons would enter the dovecote in a variety of ways, depending on the size, shape and type of structure, with the most common entry/exit point (known as the flight entrance) being provided beneath a cupola on the roof of the structure. The birds would be encouraged to roost and breed within the structure and as pigeons are quite prolific breeders, bringing up to 8 young into the world each year, competition for breeding cubicles would be high. As the main purpose of a dovecote was to provide food, and as the pigeon squab (or chick) was seen as a delicacy, squabs would be ‘farmed’ when they achieved a certain age and size (normally 4 weeks of age). In the 16th century eating pigeon meat became much more popular with ‘pigeon pie’ becoming a delicacy and often described as ‘food fit for kings’ – this rather dispels the myth that pigeons are disease carriers! As a result of this popularisation, pigeon meat not only graced the tables of the monarchy and the rich, it became a standard food for the masses and it was commonly said that every family should eat squab at least once a week. Some squab ‘farms’ were believed to house anything from 10,000 to 30,000 birds to satisfy this demand. In order to access breeding cubicles and remove squabs an ingenious system had to be designed based on the inaccessibility of nests and the sheer height and size of some of the larger dovecotes. For smaller dovecotes a free-standing ladder was used for access but for larger structures a ‘potence’ was used, although more commonly for round rather than square or rectangular dovecotes. The potence consisted of a large vertical wooden pole situated in the centre of the interior and which was pivoted both at the base and at the top, allowing the pole to rotate 360°. Several lateral arms were joined to the vertical post at right angles to which ladders were attached. As the main pole was rotated the lateral arms and ladders also rotated around the interior allowing access to all the breeding cubicles. Although the provision of food was the main purpose of the dovecote, there was one interesting and highly valued by-product that had a dual purpose – pigeon guano! Pigeon guano was, and still is, considered to be one of the finest fertilisers in the world and was a highly prized commodity as a result. In the Middle East (where eating pigeon flesh was forbidden) dovecotes were built simply to provide manure for growing fruit and this practice continued for centuries. In France, Italy and Spain guano was used extensively on hemp crops and for the fertilisation of vineyards and in England it was considered to be an extremely potent manure. It was often said that pigeon guano was worth 10 loads of other sorts (manure). In the 16th century pigeon guano was sought after for a different reason – it was found to contain saltpetre, which was used for the manufacture of gunpowder. This secret was brought across from Germany and sold for a payment of £300, which would have been a huge sum in those days. This dramatically changed the role of the dovecote in light of the fact that guano was potentially valued more highly than the birds themselves and to protect this resource armed guards were often placed outside dovecotes to stop thieves stealing the guano. Production of saltpetre from pigeon guano ended in the late 18th century when it was found to be naturally occurring in South America. 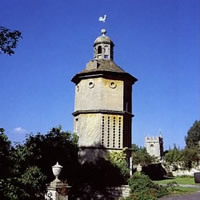 Although the commercial use of dovecotes died out in the 19th century with many magnificent examples being allowed to fall into disrepair due to neglect, they have experienced something of a re-birth in the 21st century with dovecotes being used for the control of the feral pigeon, a direct descendent of the domesticated dovecote bird. 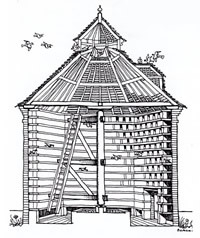 Dovecotes and pigeon lofts are now commonly used for the control of the feral pigeon in towns and cities all over the world, with the notable exception of the USA. 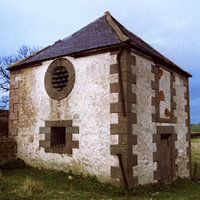 The principle of using a dovecote (or pigeon loft) as a pigeon control option was pioneered by the Pigeon Control Advisory Service International (PiCAS International) and can be loosely described as a form of birth control. Pigeons are encouraged into a dovecote by the provision of a dedicated public feeding area, sited immediately beside the dovecote, where the public will be asked to feed the birds at the same time as being asked to cease feeding elsewhere. Pigeons will then take up residence in the dovecote (based on the close proximity of a good reliable food source) and once breeding starts all eggs are removed, as laid, and replaced with dummy eggs. Where a pigeon loft is used for the purpose of control rather than a dovecote the facility would be sited on the roof of a building or even within the roof of a building, rather than at ground level. Pigeons would be encouraged into the loft by the provision of food and once breeding starts eggs would be removed and replaced in the same way as with a dovecote facility. This humane, effective and cost effective method of control is rapidly replacing the extreme use of lethal control, commonly used to control pigeon populations in the 21st century. Schemes using dovecotes, or artificial breeding facilities as they are now commonly known, have achieved staggering results where provided as a control option, often reducing pigeon flock size by as much as 50% and in some cases by as much as 95%. Pigeons will readily use a dovecote facility for the purposes of breeding and providing that some basic rules are followed this method of control, based on a concept that is more than 1000 years old, will provide any property owner or local government body with a cheap, popular and highly effective means of controlling feral pigeon populations.